Starting with Origin 2016 SR2, the LaTeX App has undergone considerable improvement. If you’ve already been using the App, make sure patch your Origin 2016 to SR2 and then choose Tools: Apps on File Exchange menu to download and install this newer version. You only need to download and install the App; there is no need to reinstall either MiKTeX or OAutotrace. Note: If you haven’t used the LaTeX App before, please read Introducing the LaTeX App. It discusses the steps necessary to install the App the first time along with basic App usage. Change the font of an equation. Add a skeletal structure diagram of a molecule to a graph. 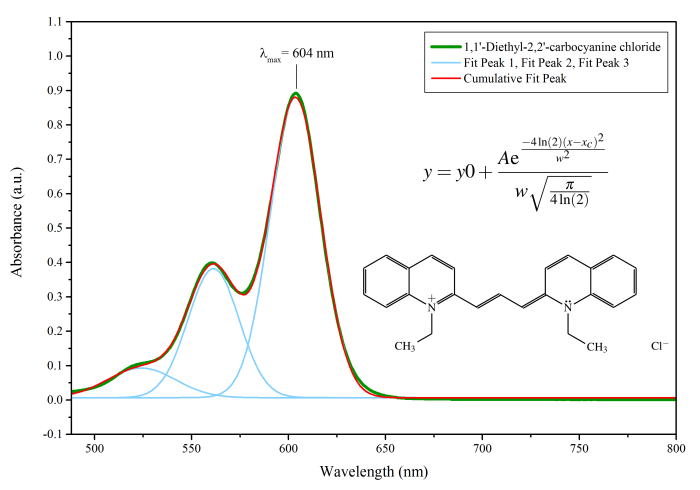 It is the UV-Vis spectrum of the linear conjugated dye 1,1′-Diethyl-2,2′-carbocyanine chloride (pinacyanol chloride). The peaks are fitted with the Gaussian fitting function. I added the formula for the Gaussian function Origin uses to the graph along with a skeletal structure of the molecule. Keep reading to find out how I did it. To download the files associated with this post click here. Note: the two *.tex files in the zipped folder can be opened in Notepad or another plain text editor. While you can view the OPJ in Origin, you will need OriginPro to rerun or edit the fitting operation. Note: If you have previously installed the earlier version 1.2, you need to first uninstall it and shut down Origin. Then go to a folder under your user name, C:\Users\<User Name>\AppData\Local\OriginLab\93\TMP\textemp\, and delete the temporary files in that folder. Then install the new version of the App. When you click the OK button in the App dialog, the typesetting engine MiKTeX may prompt you to download one or more packages. You should allow it to do so! While MiKTeX is downloading the packages, the App will pause. If for some reason the App reports an error, simply close it, reopen it, and try again. Sometimes it takes longer than anticipated for MiKTeX to download and install packages. Note: When creating molecules with the LaTeX App, you should expect that it will take some time to render it onto a graph. Both MiKTeX and the App itself mush go through several complex steps which are even more complex with output like this. So you can see that the improvement to Origin’s LaTeX App opens the door to much more than just adding generic equations to graphs. You can customize fonts, add skeletal structure diagrams, and many other things not possible with the earlier version of the App.